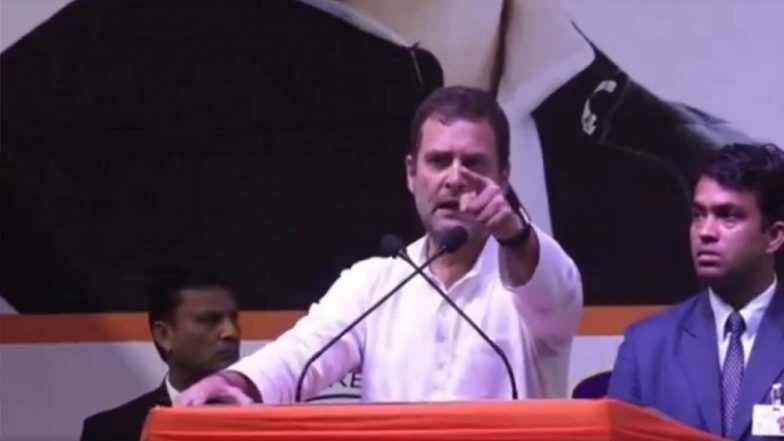 New Delhi, March 22: The Bharatiya Janata Party (BJP) on Friday took a dig at Congress President Rahul Gandhi for postponing a press conference scheduled to take place early this morning. Taking swipe at Congress chief, the BJP from its official Twitter handle tweeted: "It seems Rahul Gandhi can’t wake up in the morning. Anyway, it’s better not to spread lies in the morning." Rahul Gandhi was scheduled to address a press conference at 10.15 am at the Congress headquarters in the national capital. Minutes before the press meet was to begin, the Congress postponed it to 1:00 pm. It was then the BJP took a swipe at the Congress president. Hitting back at the BJP, the Congress virtually dared Prime Minister Narendra Modi for holding a press conference. PM Narendra Modi Hits Out at Sam Pitroda For Questioning Balakot Death Toll, Says 'Congress Celebrating Pakistan National Day'. "Morning, noon or night, we’d be happy to hear ChorChowkidar give a press conference - that is, if he’s able to," the Congress's official handle tweeted. “Rahul Gandhi is not only up in the morning, he is also attending the Core Committee meeting since 9:15 AM,” Congress’s Pranav Jha tweeted. The Congress finally held a press conference at around 2:00 pm. However, instead of Rahul Gandhi, the press conference was addressed by Congress spokesperson Randeep Singh Surjewala who accused senior BJP leaders including Finance Minister Arun Jaitley and Home Minister Rajnath Singh of accepting bribes. It is believed Gandhi skipped the press conference due to ongoing controversy around his close confident Sam Piroda's comments. Piroda said that incidents like the Pulwama terror attack "happen all the time" and that the United Progressive Alliance government also could have sent planes across the border after the 2008 Mumbai terror attack but "that is not the right approach".